Restaurants often have a sneaky way of making normally healthy foods ridiculously high in calories. A salad that could be made at home with only a couple hundred calories suddenly has 3,000 calories in it at a restaurant, thanks to the rich dressing and other additions. Some restaurants completely own their high-calorie meals and turn them into drawing points for customers. Restaurants will advertise things like “The Biggest Burger You’ve Ever Eaten” and even reward that customer for finishing the gargantuan meal. Many people seek out these calorie-ridden treats and simply can’t avoid all the sweet or savory goodness they have to offer. 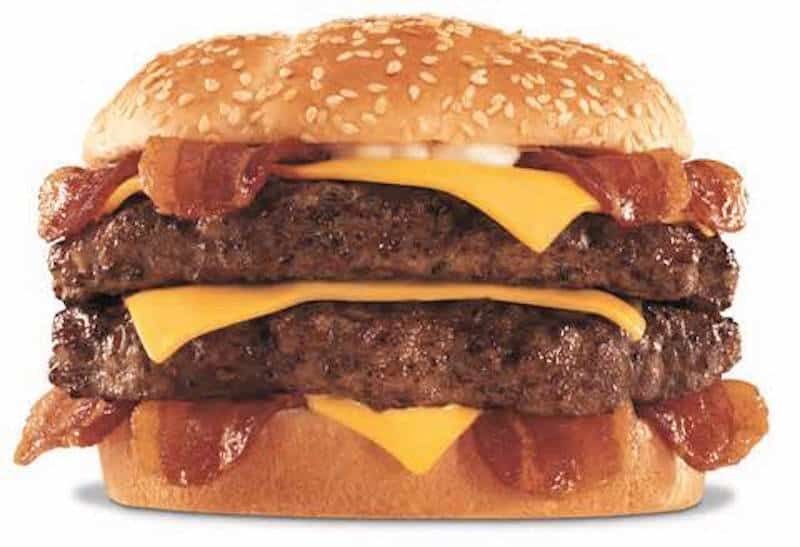 Here are 16 restaurant meals with unimaginably high caloric content. Bacon is a staple in many diets and creative cooks are constantly coming up with new ways to incorporate it into meals. 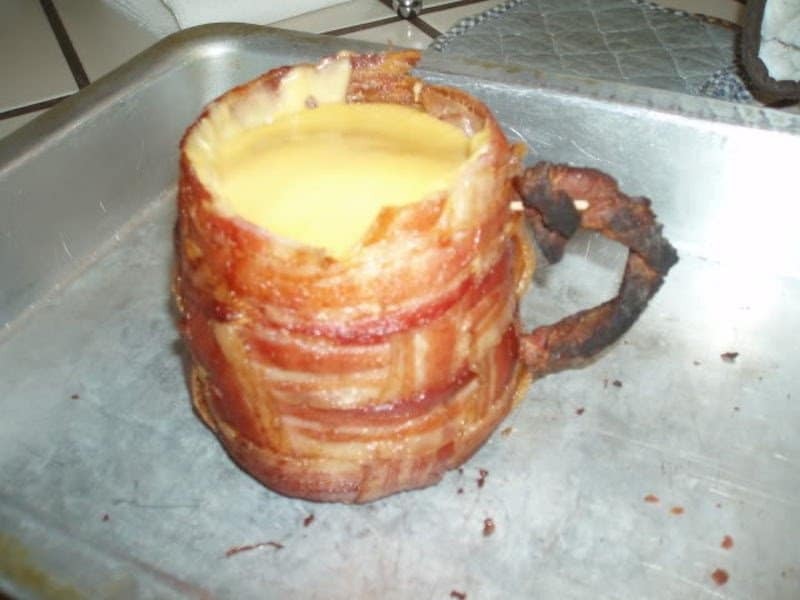 One clever cook decide to make a mug out of bacon, biscuits, and cheese. It offers a whopping 2,400 calories and 158 grams of fat. “Healthy eating” isn’t the first thing that comes to mind when you hear “KFC”. 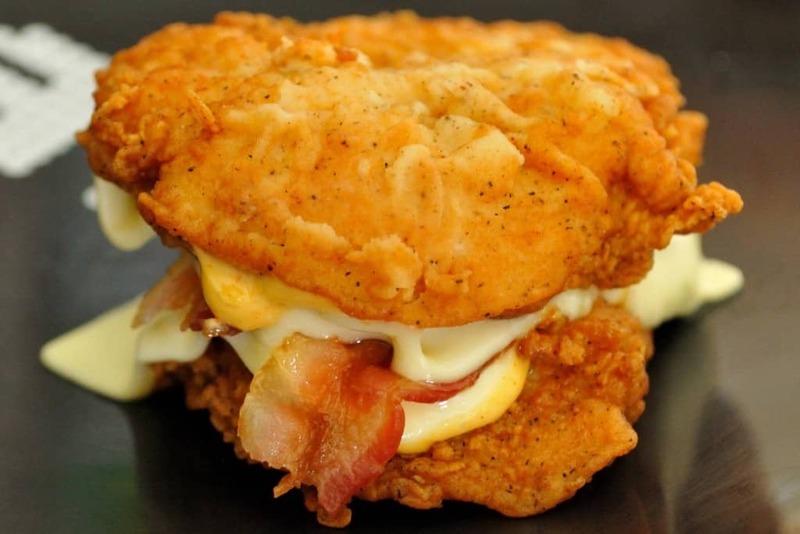 KFC’s Double Down sandwich is still shocking though, as it packs over 32 grams of fat and 1,430 milligrams of sodium. The actual caloric content is often disputed, but as it’s made of fried chicken, bacon, and cheese, it’s definitely not a low-calorie option. Pizza and cookies are two very great things, but when someone decided to bring them together, something crazy happened. 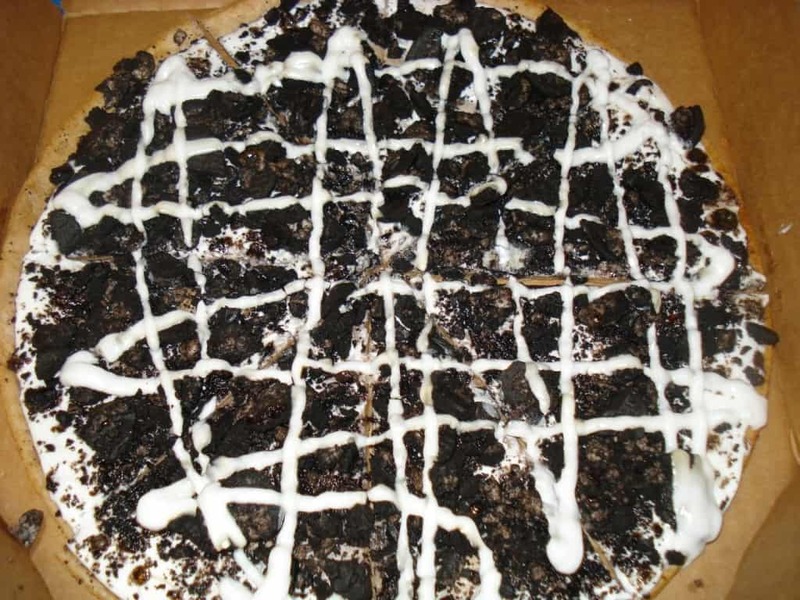 With 32g of fat and 960 calories, this cookie pizza is one wild treat. 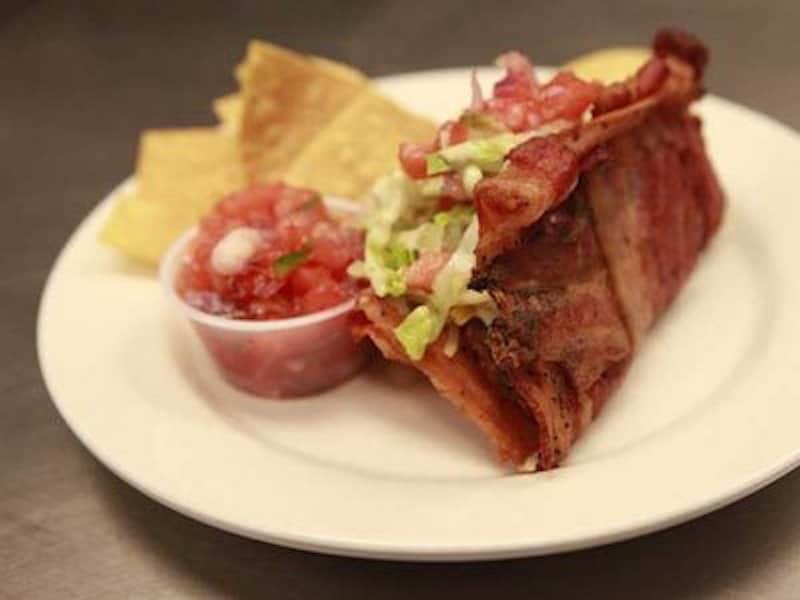 Using woven bacon as a taco shell rather than the typical corn tortilla, the Bacon Taco Supreme is definitely not a healthy choice. Depending on the fillings you choose, one of these can be upwards of 1,000 calories. 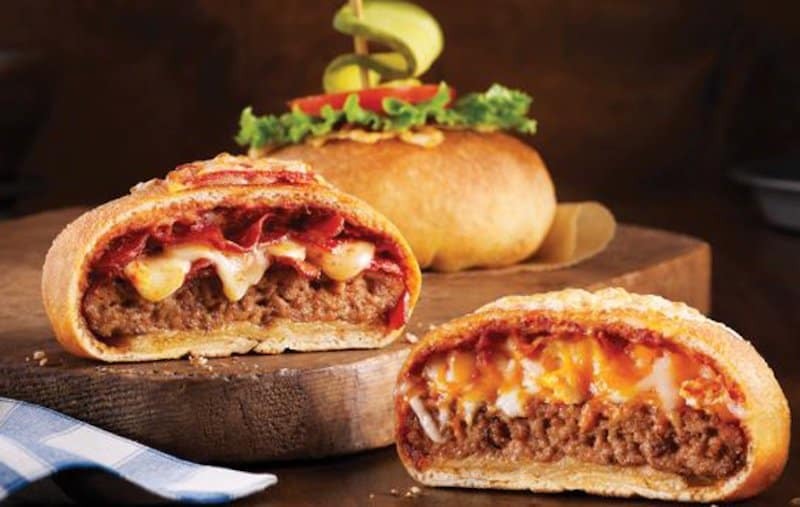 It’s a bird, it’s a plane, it’s a… PIZZA BURGER! 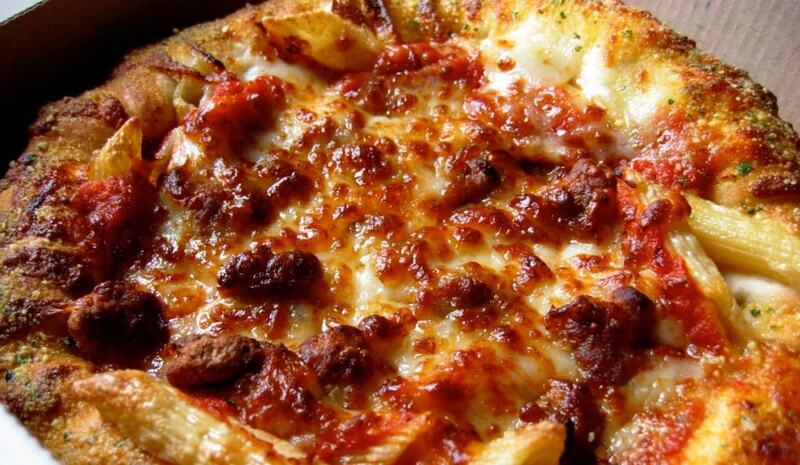 Boston Pizza serves up this concoction that contains 1,400 calories and 1,300 milligrams of sodium. 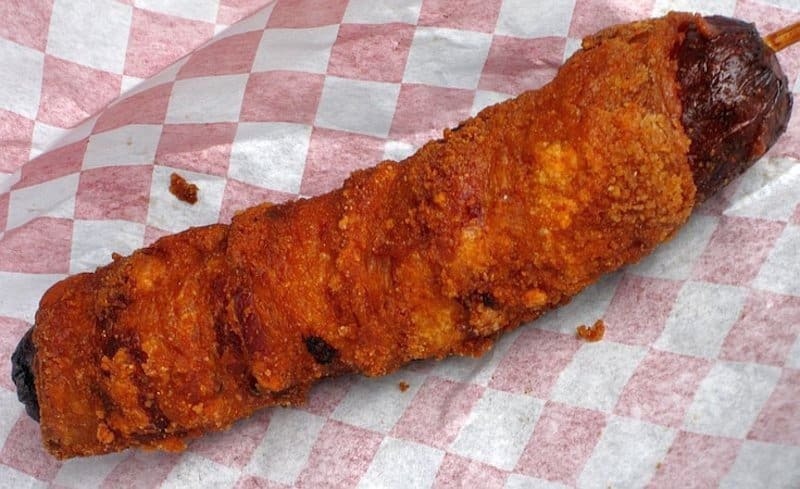 It’s deep fried, then wrapped in bacon, and then fried again. It probably got its name as the “Danger Dog” due to the artery clogging 400 calories and 30 grams of fat, in just one of them! 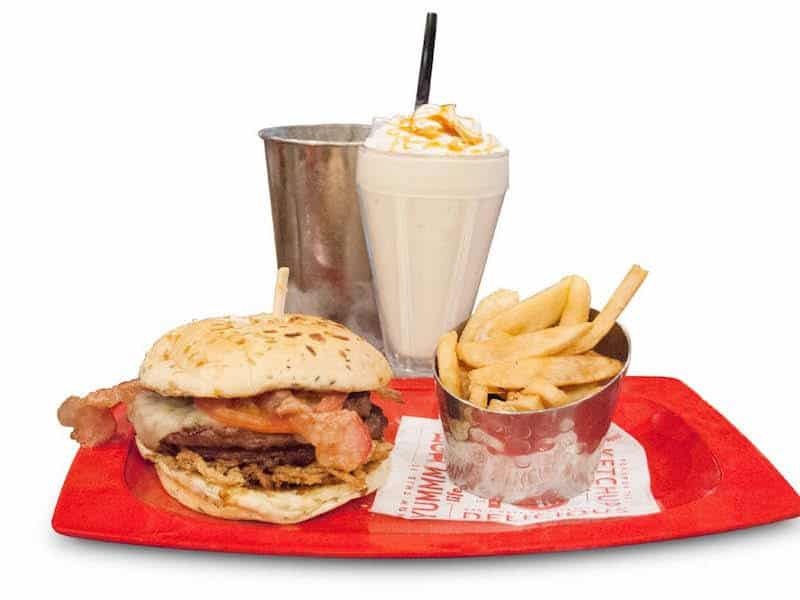 Served with bottomless fries and a caramel milkshake, Red Robin’s offers up one of the highest calorie meals ever. With over 3,500 calories, this really is one monster of a meal. 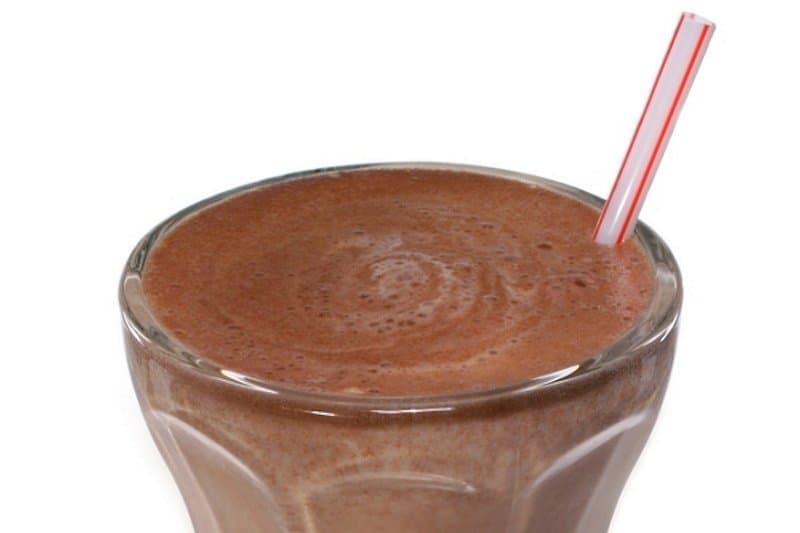 Just one of these chocolate shakes from fast-food chain White Castle has a startling 1,680 calories. While they may taste delicious, you probably shouldn’t be having one of these too often. 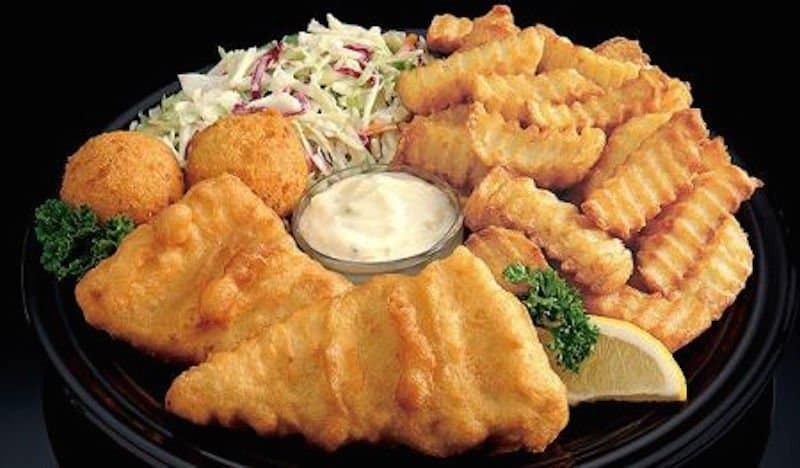 If you’re craving fish n’ chips and you decide to satisfy your craving with a meal from Nathan’s, you’ll be consuming around 1,530 calories in one meal. Another burger with “monster” in its name is so-called due to its 1,500 calories of deliciousness. The calorific value in this burger may be high, but who could resist a burger like that? 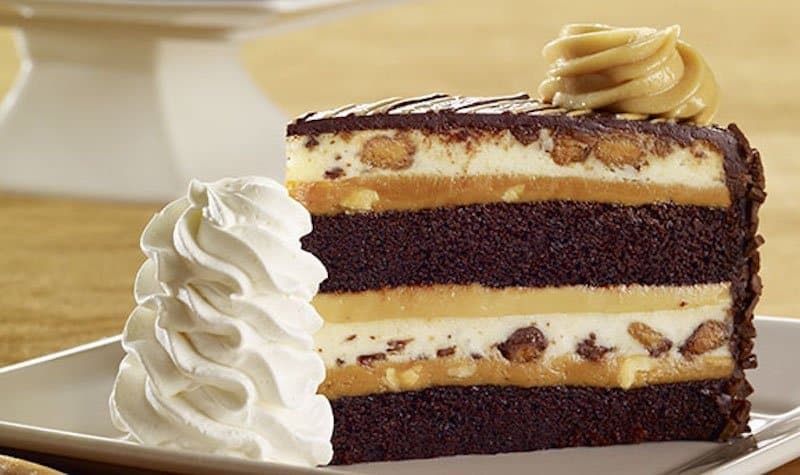 Just one slice of this delicious desert from Cheesecake Factory contains over 1,500 calories. While that desert may look irresistible, ask yourself is it really worth it? 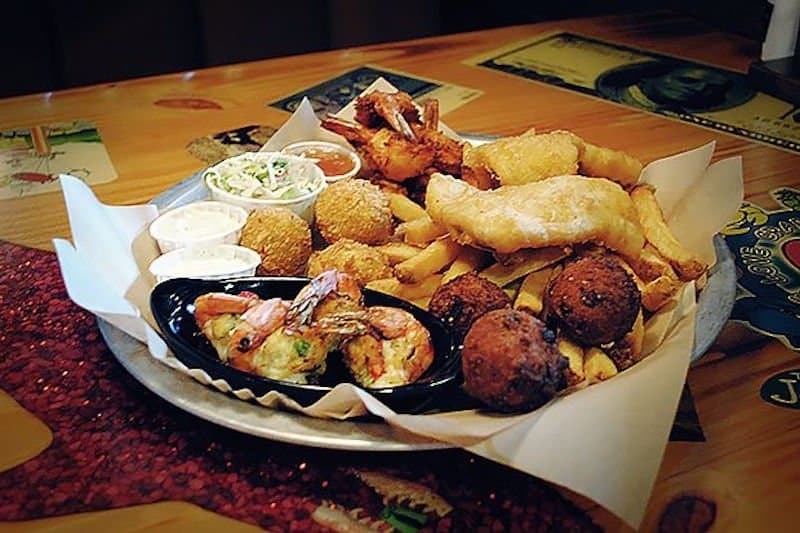 This platter from Joe’s Crab Shack really has it all, including over 2,750 calories! That’s approximately 150% of the average adult’s recommended daily intake… in one meal. 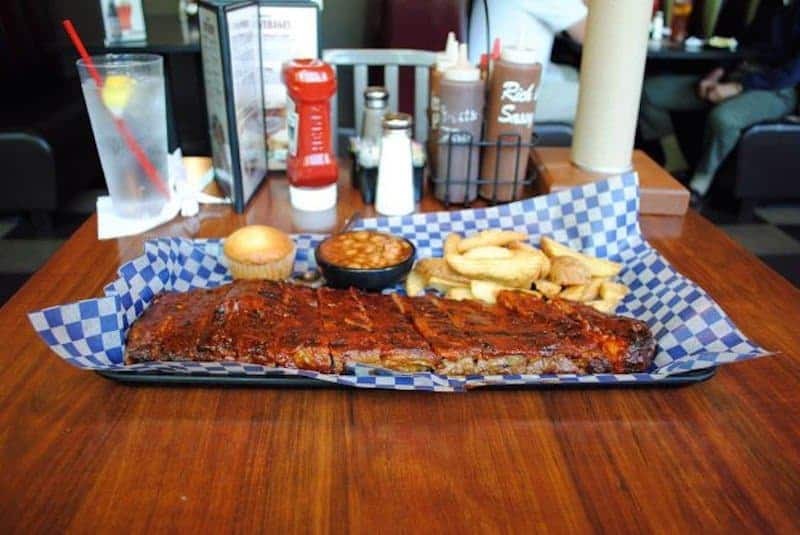 At Famous Dave’s you can get his big slab of St. Louis style ribs, but it contains close to 2,800 calories, so you may as well skip dinner for the rest of the week. Denny’s is a very popular breakfast and late night stop for diners. 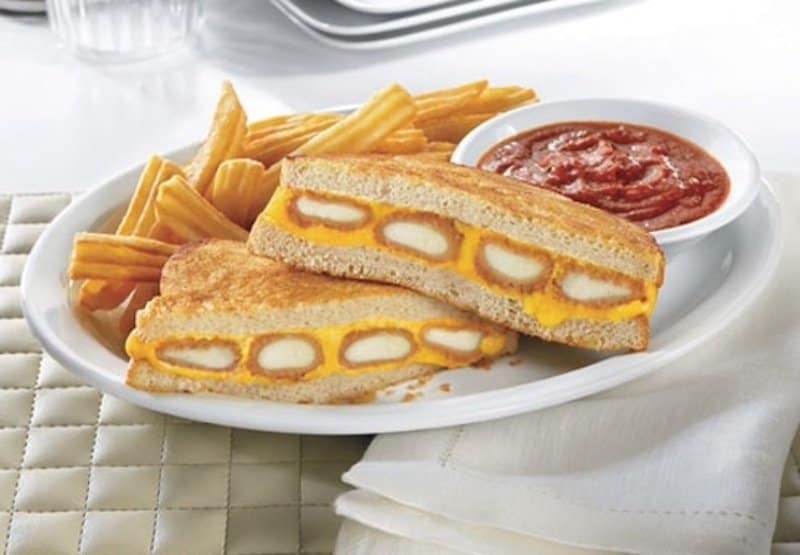 They offer a fried cheese melt that is a grilled cheese sandwich with mozzarella sticks added in the middle, along with cheddar cheese. It’s not surprising that this sandwich packs an alarming 1,200 calories. Although it’s no longer on the menu, at one point you could get this 1,500 calorie serving of carbs, carbs, and more carbs at Domino’s restaurants. 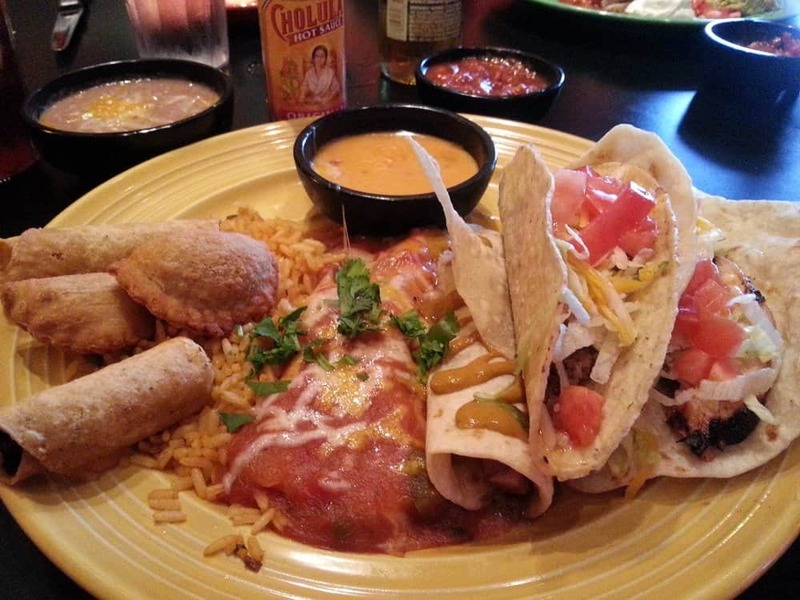 The ultimate tex-mex meal, the Conquistador from Don Pablo’s, has an astounding 1,900 calories and 87 grams of fat!